Histograms! Histograms group data that is close together into “classes” and shows how many or what percentage of the data fall into each “class”. It. 1 Histograms! 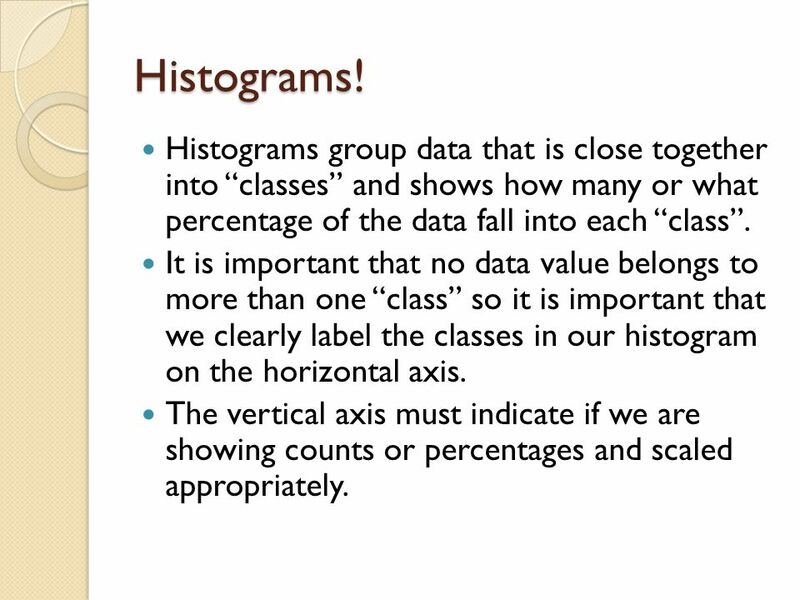 Histograms group data that is close together into “classes” and shows how many or what percentage of the data fall into each “class”. 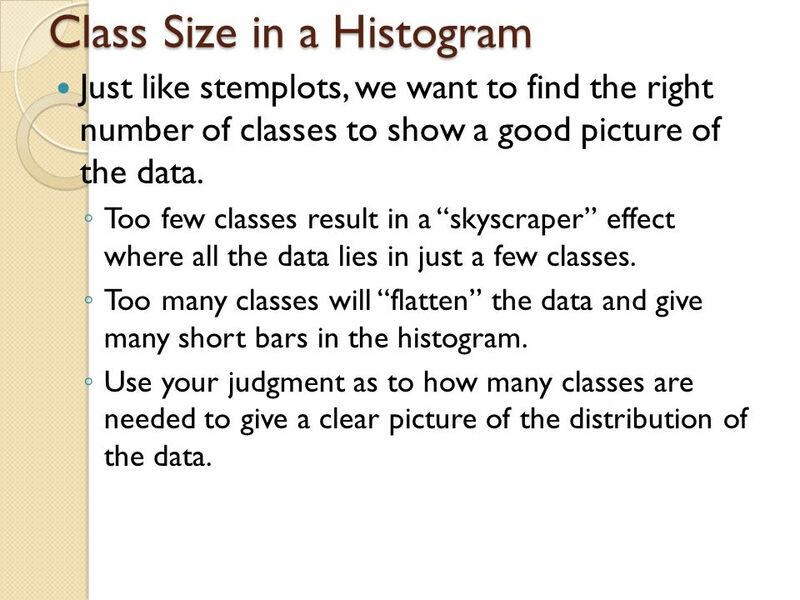 It is important that no data value belongs to more than one “class” so it is important that we clearly label the classes in our histogram on the horizontal axis. The vertical axis must indicate if we are showing counts or percentages and scaled appropriately. Just like stemplots, we want to find the right number of classes to show a good picture of the data. Too few classes result in a “skyscraper” effect where all the data lies in just a few classes. Too many classes will “flatten” the data and give many short bars in the histogram. Use your judgment as to how many classes are needed to give a clear picture of the distribution of the data. 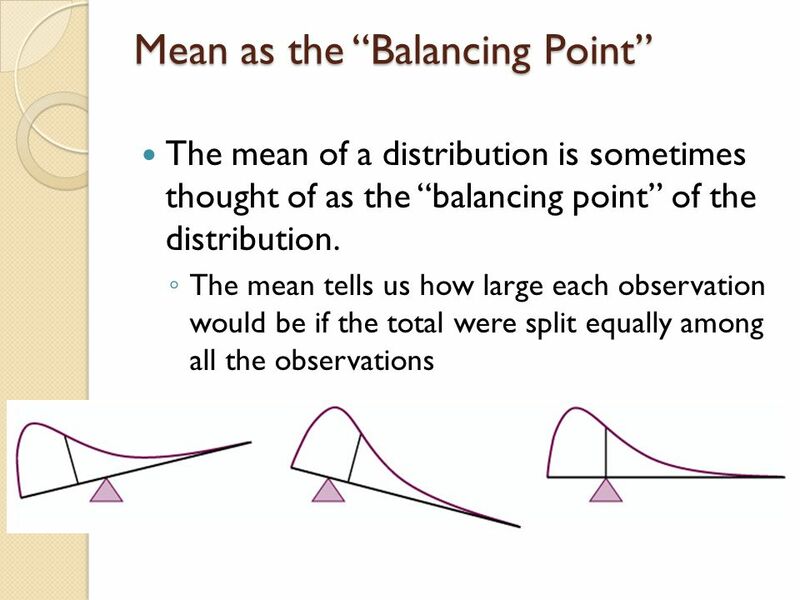 The mean and median of a roughly symmetric distribution are close together. 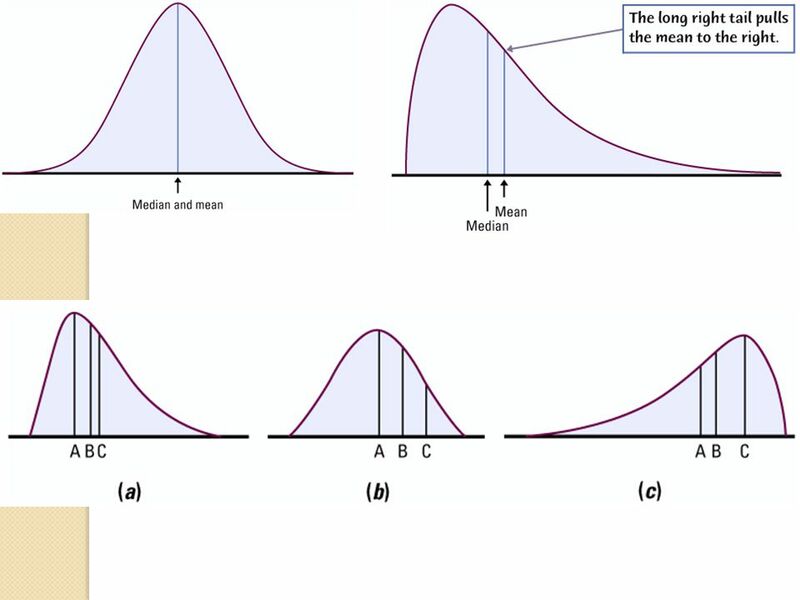 If the distribution is exactly symmetric the mean and median will be equal. 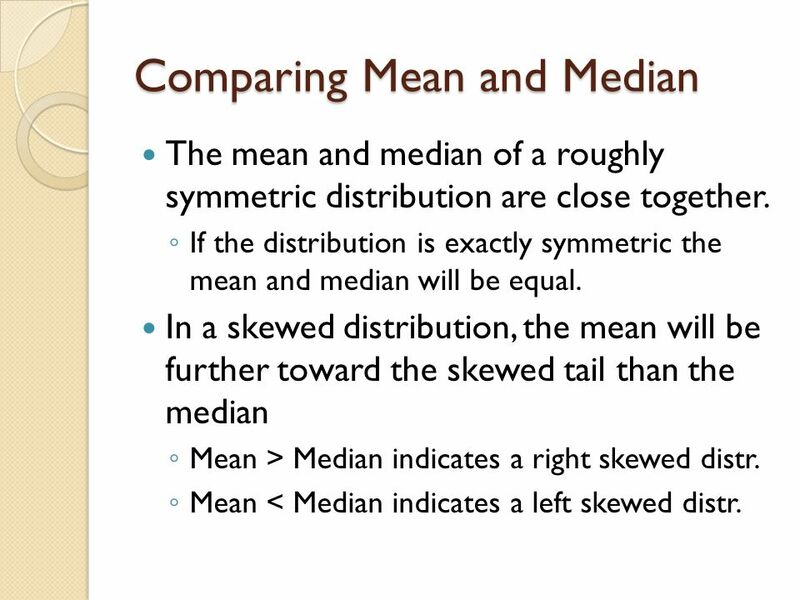 In a skewed distribution, the mean will be further toward the skewed tail than the median Mean > Median indicates a right skewed distr. 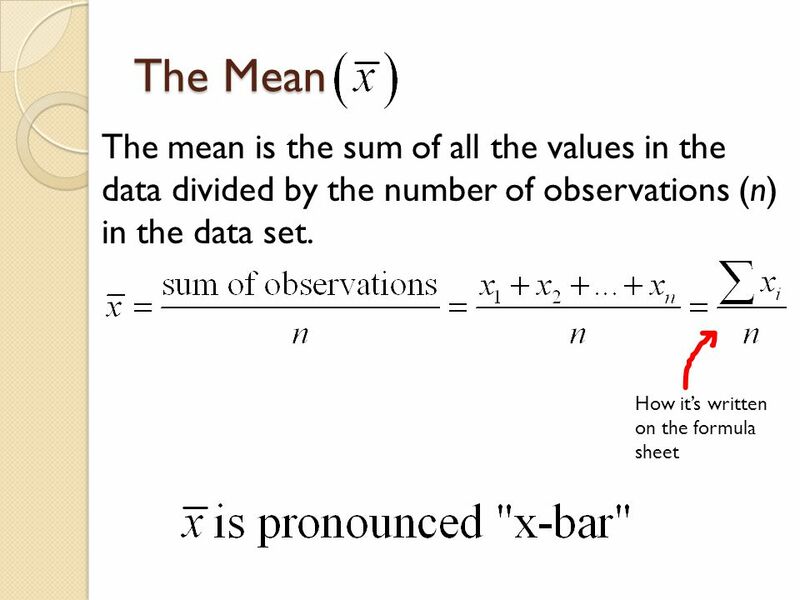 Mean < Median indicates a left skewed distr. 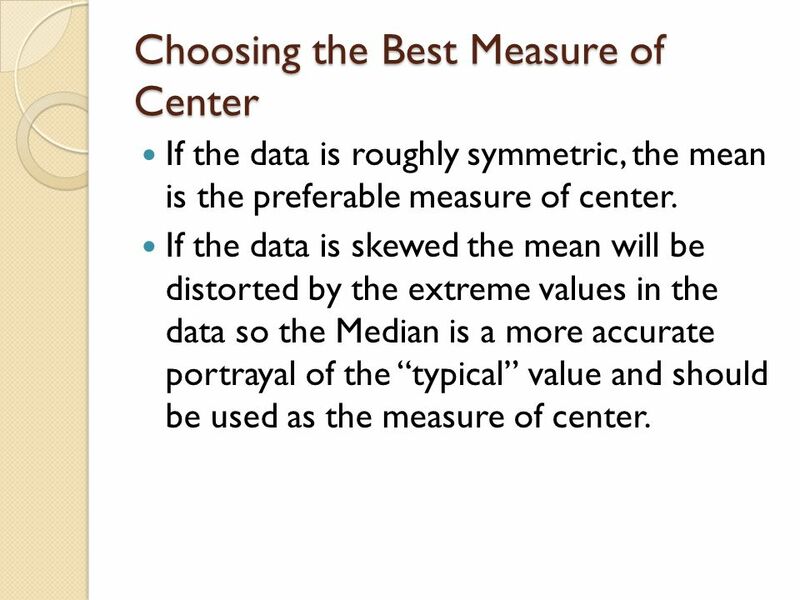 If the data is roughly symmetric, the mean is the preferable measure of center. 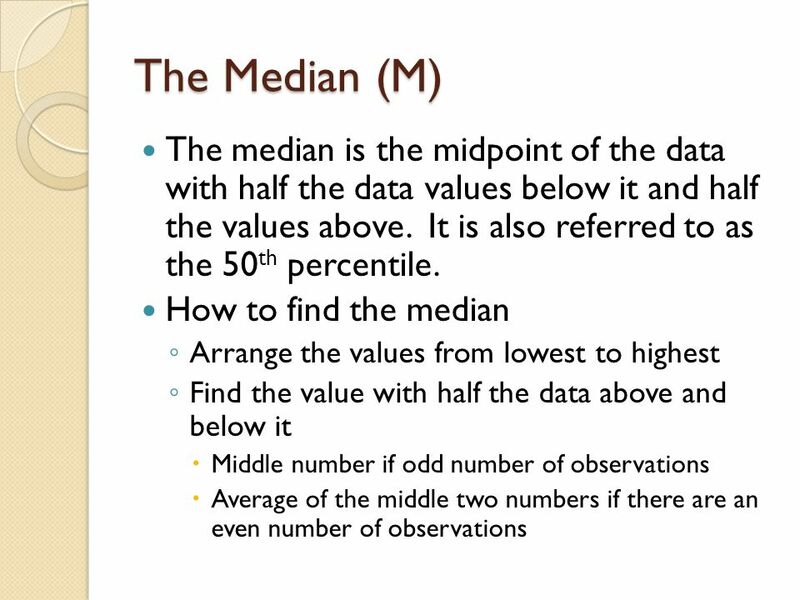 If the data is skewed the mean will be distorted by the extreme values in the data so the Median is a more accurate portrayal of the “typical” value and should be used as the measure of center. 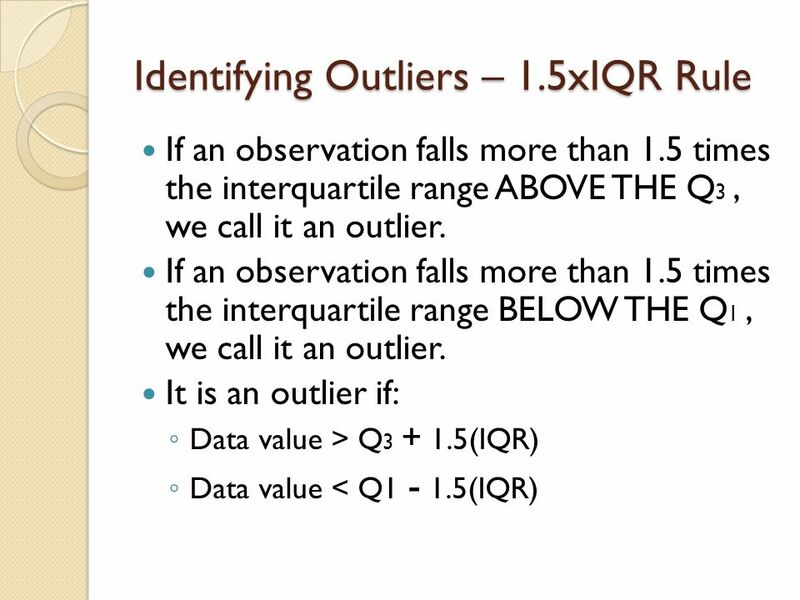 15 Measuring Spread: IQR The 1st Quartile (Q1) is the median of the lower half of the data not including the median. The 3rd Quartile (Q3)is the median of the upper half of the data not including the median. 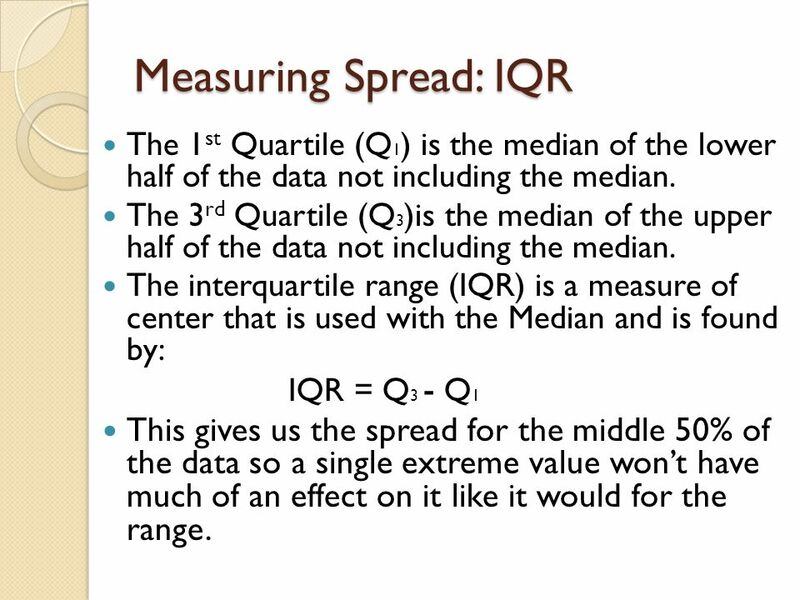 The interquartile range (IQR) is a measure of center that is used with the Median and is found by: IQR = Q3 - Q1 This gives us the spread for the middle 50% of the data so a single extreme value won’t have much of an effect on it like it would for the range. 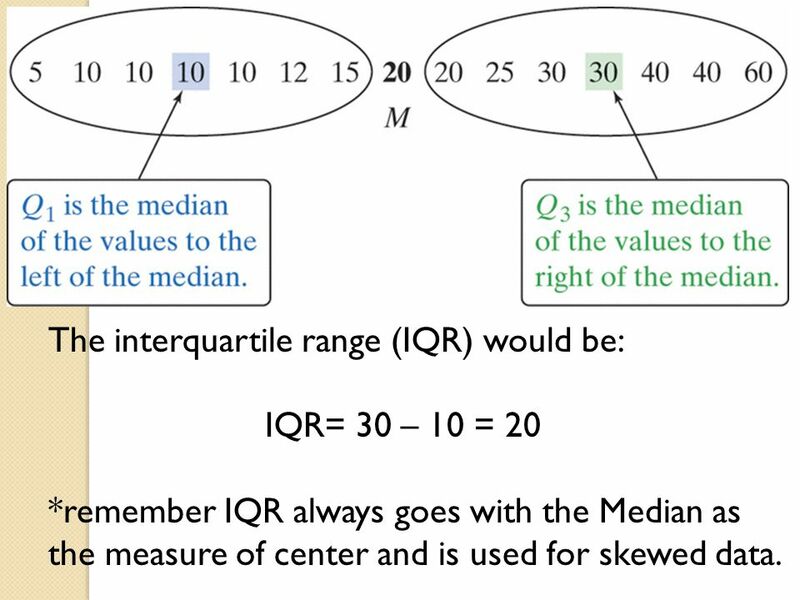 *remember IQR always goes with the Median as the measure of center and is used for skewed data. Download ppt "Histograms! Histograms group data that is close together into “classes” and shows how many or what percentage of the data fall into each “class”. It." Very simple to create with each dot representing a data value. Best for non continuous data but can be made for and quantitative data 2004 US Womens Soccer. 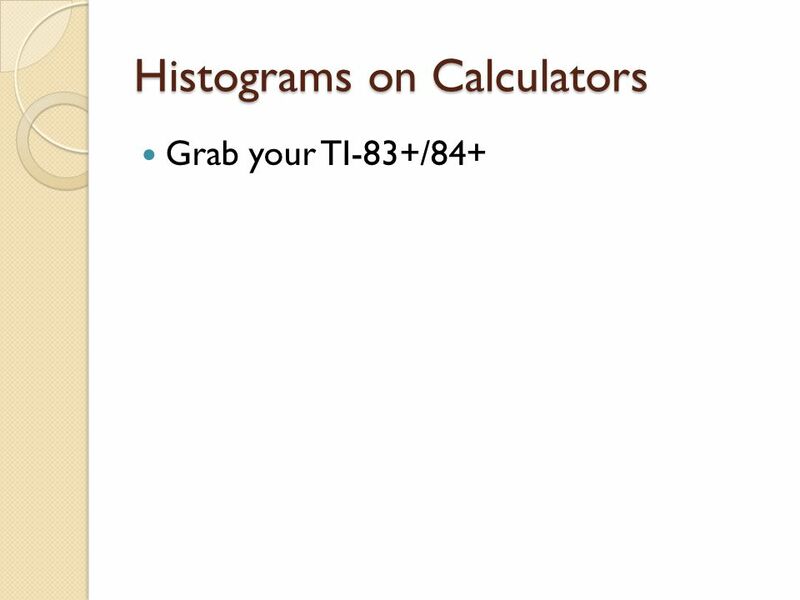 T-3 Histograms. 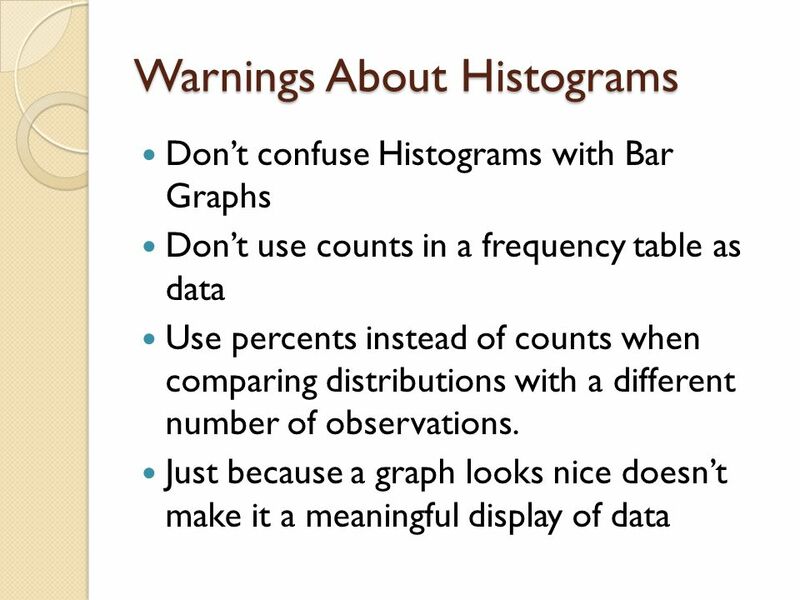 Histogram Basics A histogram is a special type of bar graph that measures the frequency of data Horizontal axis: represents values in. WARM UP 1.What is the difference between a bar graph and a histogram? 2.How do you find the class width? 3.A line graph represents what? 4.Make a stem. 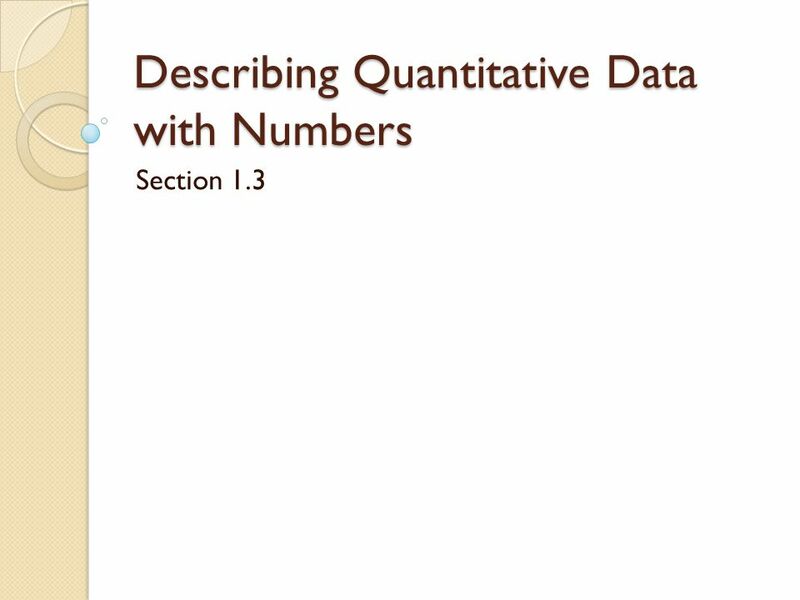 Copyright © 2013, 2009, and 2007, Pearson Education, Inc. Chapter 2 Exploring Data with Graphs and Numerical Summaries Section 2.2 Graphical Summaries. Histograms. Definition of a Histogram A Histogram displays a range of values of a variable that have been broken into groups or intervals. Histograms. Descriptive Statistics Summarizing data using graphs. Section 1.6 Frequency Distributions and Histograms. 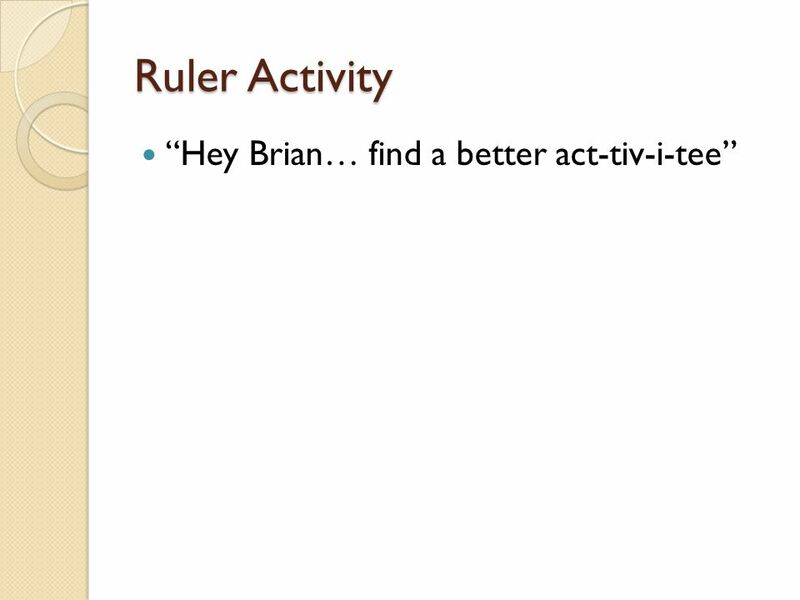 Bar Graphs and Line Graphs Lesson 7-4. Bar Graph A bar graph uses vertical or horizontal bars to display numerical information. Bar graphs can be used. Histogram Most common graph of the distribution of one quantitative variable. Quantitative Data Continued Histograms. Used with numerical data Bars touch on histograms Two types – Discrete Bars are centered over discrete values. 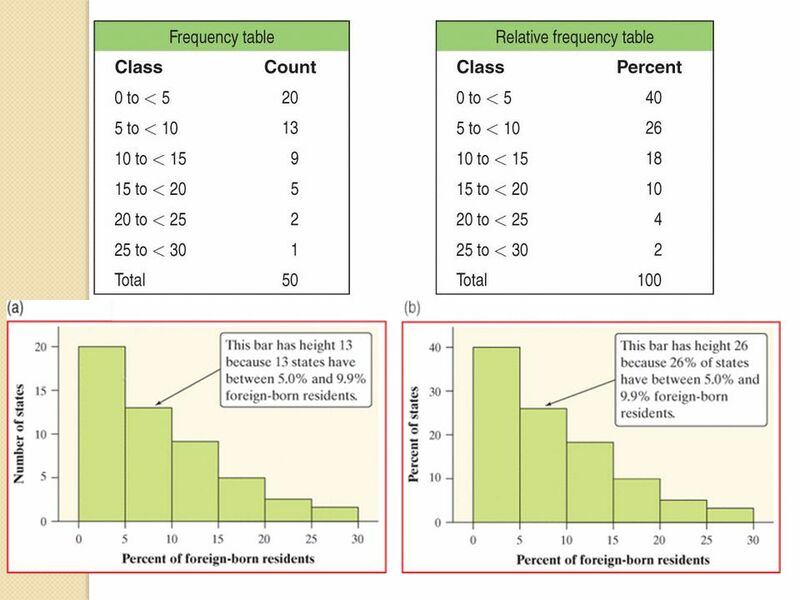 Frequency Tables Histograms. Frequency-How often something happens. Frequency Table- A way to organize data in equal intervals. Histogram- Shows how frequently. EXAMPLE 1 Making a Frequency Table Science The numbers of named stars in a group of 34 constellations are listed below. Make a frequency table of the data. 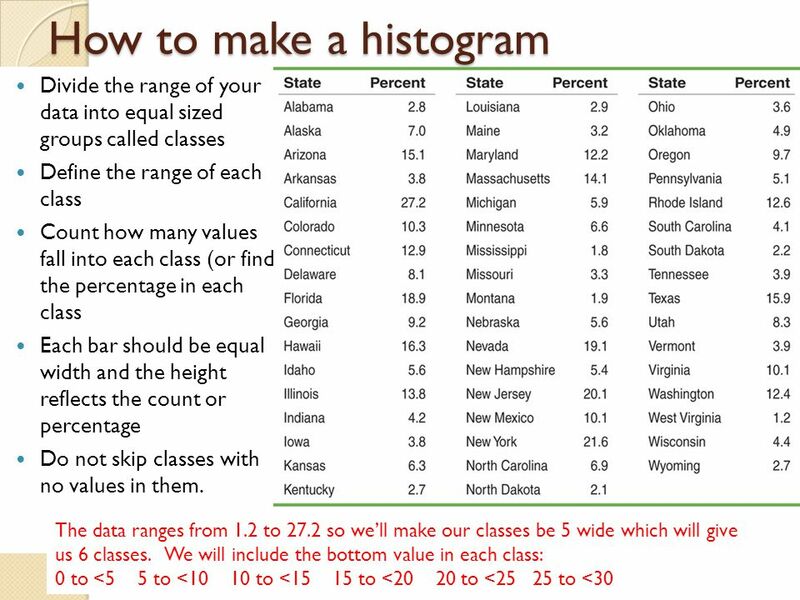 Lesson 5 Histograms and Box Plots. Histograms A bar graph that is used to display the frequency of data divided into equal intervals. The bars must be. 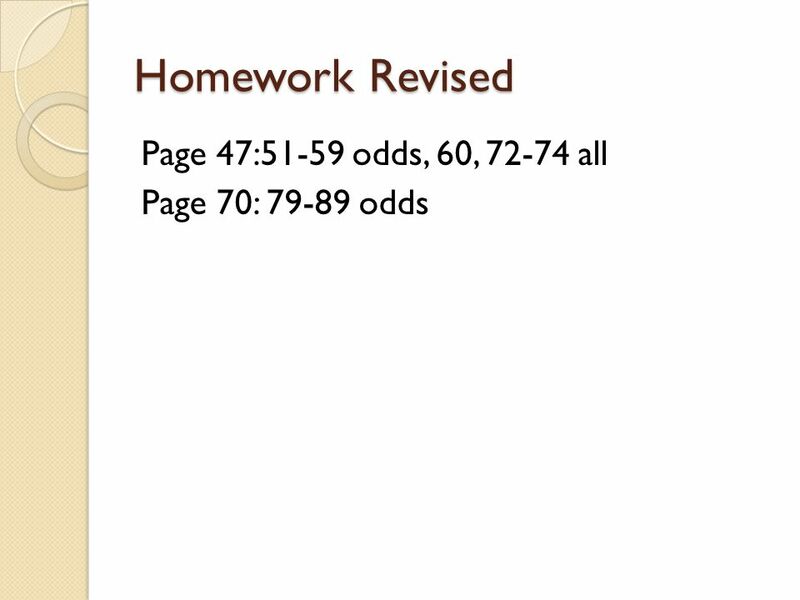 Frequency Distributions Chapter 3 Homework: 1, 2, 3, 12. Warm Up Problem  Solve for x: 6x + 1 = 37. Histograms Lesson 12-2. Bar Graphs, Histograms, Line Graphs Arizona State Standard – Solve problems by selecting, constructing, interpreting, and calculating with displays of. Unit 2 Section : Histograms, Frequency Polygons, and Ogives  Graphs are used to present data after it has been organized into frequency distributions.